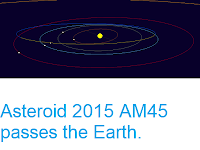 Sciency Thoughts: Asteroid 2008 PW4 passes the Earth. Asteroid 2008 PW4 passed by the Earth at a distance of about 11 169 000 km (29.0 times the average distance between the Earth and the Moon, or 7.47% of the distance between the Earth and the Sun), slightly after noon GMT on Friday 7 September 2018. There was no danger of the asteroid hitting us, though were it to do so it would have presented a significant threat. 2008 PW4 has an estimated equivalent diameter of 65-210 m (i.e. it is estimated that a spherical object with the same volume would be 65-210 m in diameter), and an object at the upper end of this range would be predicted to be capable of passing through the Earth's atmosphere relatively intact, impacting the ground directly with an explosion that would be 19 000 times as powerful as the Hiroshima bomb. Such an impact would result in an impact crater more than 3 km in diameter and devastation on a global scale, as well as climatic effects that would last years or even decades. 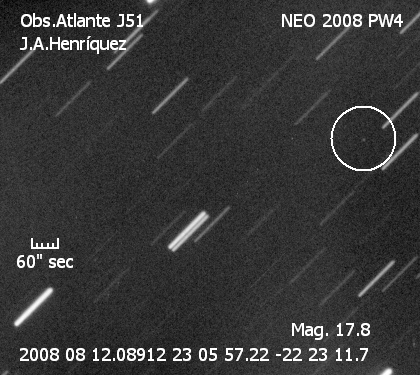 Image of 2008 PW4 taken from the Observatorio Atlante on Tenerife on 12 August 2008. 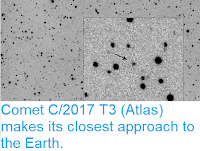 The long lines being stars which have moved over the course of the exposures and the asteroid the object circled in at the right of the image. The scale bar is in arc seconds (") and is equivalent to one arc minute ('), or one sixtieth of a degree (°) (the whole sky - including the but behind the Earth - is divided into 360 degrees, each degree into 60 minutes and each minute into 60 seconds). Juan Antonio Henríquez Santana/Observatorio Atlante. 2008 PW4 was discovered on 5 August 2008 by the Siding Spring Observatory near Coonabarabran in New South Wales. The designation 2008 PW4 implies that it was the 122nd asteroid (asteroid W4) discovered in the first half of August 2008 (period 2008 P). 2008 PW4 has a 457 day orbital period and an eccentric orbit tilted at an angle of 2.68° to the plane of the Solar System, which takes it from 0.84 AU from the Sun (i.e. 84% of he average distance at which the Earth orbits the Sun) to 1.48 AU from the Sun (i.e. 148% of the average distance at which the Earth orbits the Sun, and slightly closer to the Sun than the planet Mars). It is therefore classed as an Apollo Group Asteroid (an asteroid that is on average further from the Sun than the Earth, but which does get closer). This means that close encounters between the asteroid and Earth are extremely common, with the last having occurred in March 2014 and the next predicted in March 2019. The calculated orbit of 2008 PW4. Minor Planet Center. 2008 PW4 also has frequent close encounters with the planets Venus, which it last came close to in March 1986 and is next predicted to pass in January 2020, and Mars which it last came close to in April this year and is next predicted to pass in February 2022. 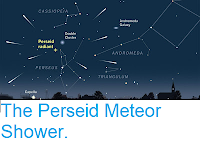 Asteroids which make close passes to multiple planets are considered to be in unstable orbits, and are often eventually knocked out of these orbits by these encounters, either being knocked onto a new, more stable orbit, dropped into the Sun, knocked out of the Solar System or occasionally colliding with a planet.